Before you jump into a kitchen sink purchase, you'll want to be aware of the available options. 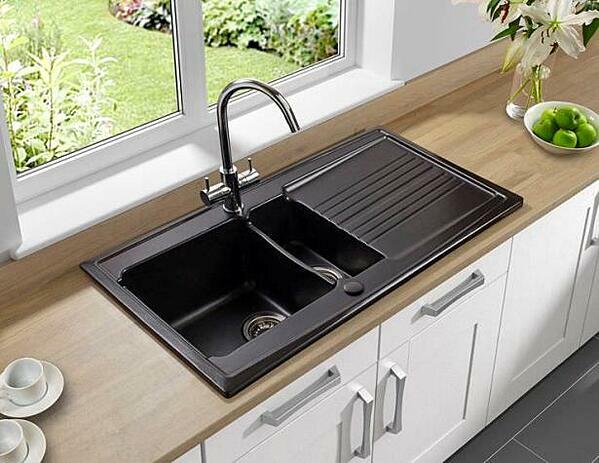 While you may think you just need a sink that’s the right size or colour for your kitchen, there’s a lot to consider about the type of sink that will work best in your kitchen as well. 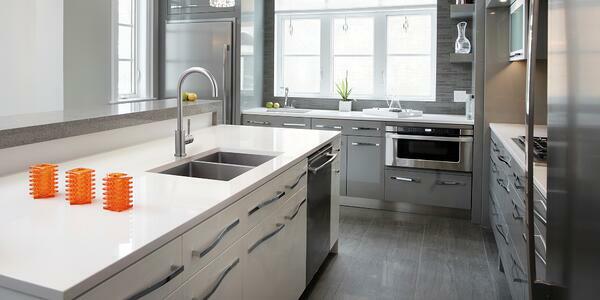 Check out nine common types of kitchen sinks below. This sink style can be called by several names and are the most popular sinks. 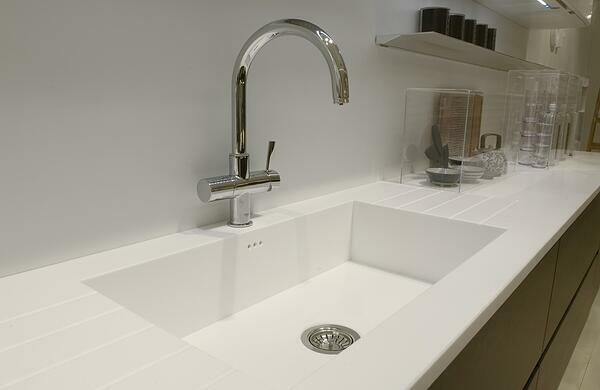 A drop-in sink is one that has a visible lip around the perimeter and rests flat on the counter. Like the name suggests, these sinks drop right into the countertop space cut out and the lip of the sink holds it in place. Undermount sinks are those that are installed from below the countertop. This sink style has a rim, but the rim isn’t visible as it attaches to the bottom of the counter, The Spruce says. 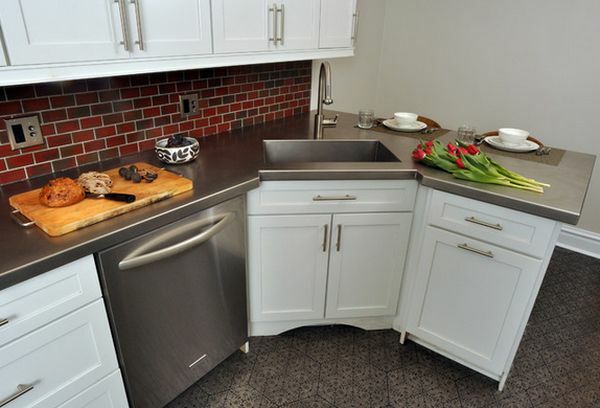 Undermount kitchen sinks will give you more countertop space than top-mount or drop-in sink options. It's best to pair an undermount sink with a solid countertop material. 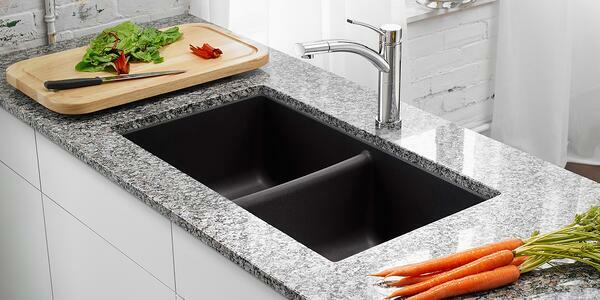 Solid materials like granite, marble, and concrete are strong enough to hold the weight of a sink and its contents. 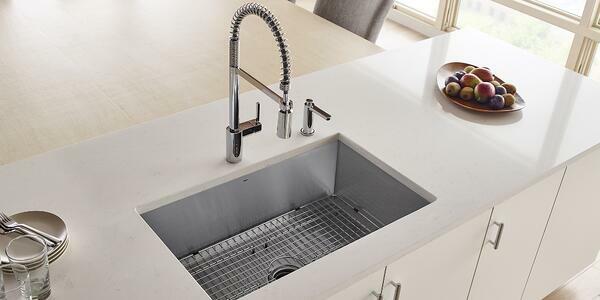 This style sink is not well suited for laminate or tile counters because they have too many weak points along seams and grout lines, making it harder to support the weight of the sink, Kitchn says. A farmhouse sink, also called an “apron sink,” is a sink style featuring an exposed front. 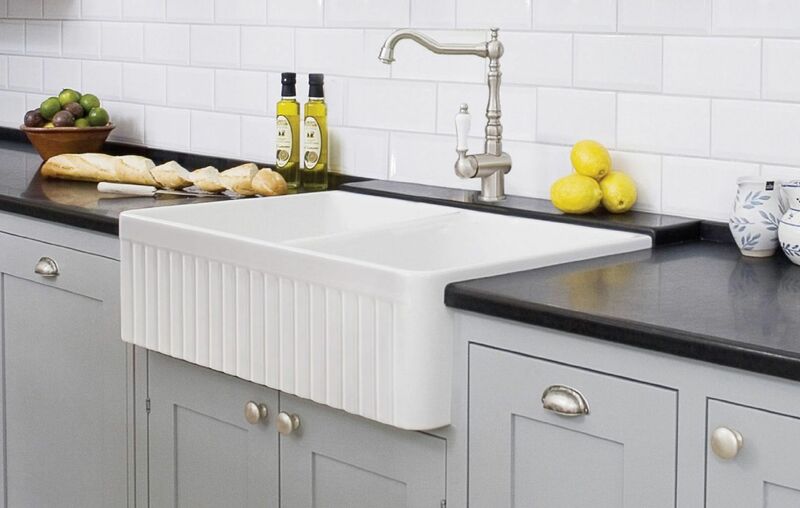 Farmhouse sinks also have large, deep basins, and are generally much deeper than modern undermount or top-mount kitchen sinks, making it easy to wash bigger pots and pans. Originally designed to sit slightly to the front of the surrounding cabinets, farmhouse sinks prevent water from landing on and damaging cabinets, Houzz says. Instead, their design allows any excess water to flow down the front of the sink and onto the floor. The look and feel of a farmhouse sink is nostalgic and bring a sense of rustic character. Farmhouse sinks can enhance both country- and traditional-style kitchens. A single basin or single bowl sink have one basin. These sinks are usually available in compact sizes, so they will fit in kitchens of any size. Although many people think the more sink bowls, the better, single bowl sinks are designed to fit the same space. This makes scrubbing bigger dishes just as easy. Without corners or edges, single basin sinks are also easier and faster to clean. Most often, they’re cheaper than their multiple bowl counterparts as well, though they’re not as versatile and may use more water and detergent. Either called double basin sinks or double bowl sinks, these kitchen sinks are rectangular with two side-by-side bowls or basins. The bowls, which are separated by a partition, can be the same size or different sizes. The most common measurements for double bowl sinks are 13 inches by 18 inches and 30 inches by 20 inches, Kitchn says. Double bowl sinks tend to take up more counter space than single bowl sinks, so they’re not usually a good idea for smaller kitchens. However, you can multitask with double bowl sinks. You can use one basin for food prep, and the other for washing dishes. This may reduce the impact the lost counter space has on your kitchen. This style of sink usually has an apron attached on one side or both sides. The apron on a drainboard sink overlaps part of the counter and is designed for water drainage, as mentioned above. As you could probably guess from the name, drainboard sinks are great for draining dishes. That makes this style the most convenient for those who hand wash dishes often. Smaller in size than standard sinks, bar sinks are generally 9.5 to 18 inches wide. With their small size, bar sinks are a good option if you have limited counter space and are perfect for small bar areas where you need to conserve as much space as possible. Bar sinks have a small basin, usually used for simple prep tasks such as washing fruit for cocktails. Available with one or two bowls and as either drop-in or undermounted, you have various options when it comes to bar sinks. 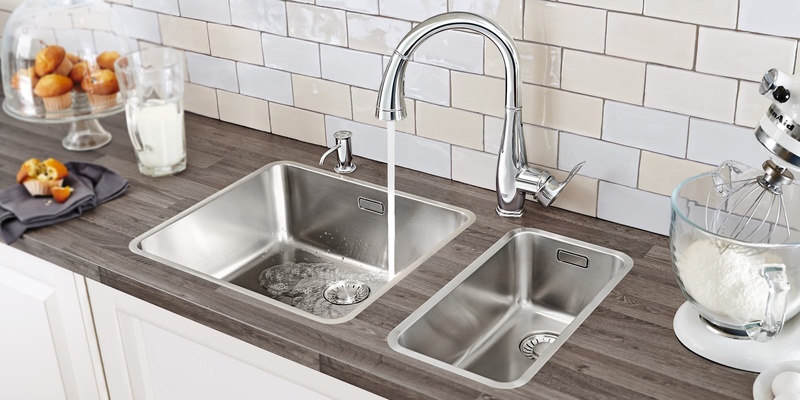 Ideal for small spaces, corner sinks are also a great option for kitchens that have a unique layout needing a specialized shape sink. 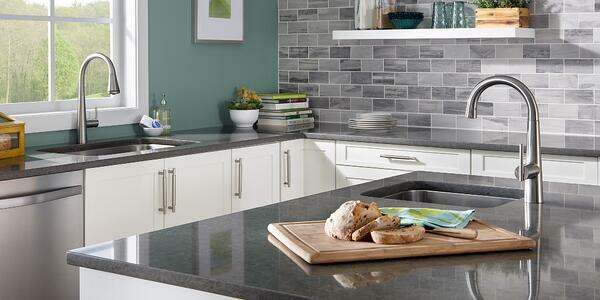 Corner sinks are great for U- or L-shaped kitchen counters and are a space-saving option, like bar sinks. Corner sinks make it possible to turn an unused corner of your kitchen into a convenient and active spot. You'll see many different names for integrated sinks during your research. Whether you go with “integrated sink countertop,” “countertop sink,” “integral sink,” or “integrated sink,” this style of kitchen sink has a vanity top with a built-in sink. Integrated sinks come in a wide variety of colours, styles, and materials. This style is a foolproof way to simplify your remodelling process for your kitchen or bathroom. 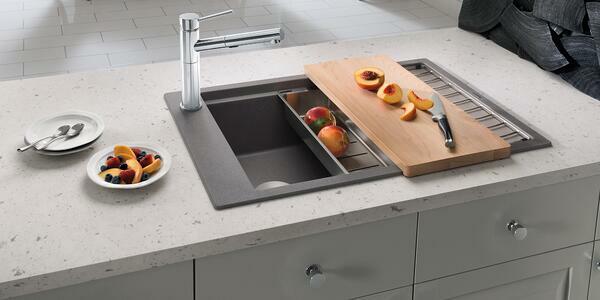 The integrated sink takes the guesswork out of choosing a sink to coordinate with a countertop or vanity. Now that you know all about the different kinds of kitchen sinks, it’s time to choose one. Come to a Kitchen & Bath Classics showroom, and our experts will help you choose the perfect kitchen sink for your home, such as Blanco sinks. A knowledgeable and passionate showroom consultant is ready to help.